Moonstone is the most well-known gemstone variety of orthoclase feldspar, a potassium aluminum silicate. It is a transparent to opaque oligoclase, a variety of plagioclase albite and sheet mica. Moonstone is known to exhibit a distinct sheen under certain lighting conditions, and it is the sheen which renders moonstone one of the most remarkable gemstones available today. In fact, its name is owed to the almost magical, bluish white shimmer it exhibits, which closely resembles that of the moon. Gemologists refer to the shimmering optical phenomena as 'adularescence'. The optical effect of adularescence is a result of moonstone's unique structural pattern. Tiny inclusions of albite, a sodium aluminum silicate, are intermixed with host rock layers of orthoclase, a potassium aluminum silicate. The alternating layers of different feldspars form a lamellar (scaly) structure which causes the interference of light as it enters the stone. Thin layers of alternating silicates tend to refract more attractive and colorful sheens, whereas thick layers of silicates produce less attractive, white to colorless sheens. As light enters the stone, it is refracted and scattered, producing an extremely unique and attractive play of both color and light. With moonstone, the aura of light actually appears to glow from deep within the surface of the stone. Moonstone was extremely popular in the times of "Art Nouveau", which took place more than 100 years ago. It was used to decorate a striking amount of pieces of gemstone jewelry created by the famous French Master-Goldsmith, René Lalique, as well as many of his contemporaries. His rare pieces are typically only found in museums or in well-guarded private collections. Moonstone can be identified by the presence of adularescence. Other gems with a similar appearance do not have the phenomenal presence of adularescence which makes identification of moonstone fairly easy. Moonstone is a potassium aluminum silicate and can be easily identified by composition. Many similar materials, such as labradorite, are actually plagioclase feldspar, whereas moonstone is by composition a potassium feldspar. Testing for hardness is often one of the easiest methods for distinguishing moonstone from other materials. Other similar gems, such as opal, chalcedony or ammolite, are significantly harder or softer than moonstone. Top quality moonstone can show an incredible "three-dimensional" depth of color, which no other gemstone can replicate, making moonstone almost unmistakable. Moonstone deposits are often found as constituents in feldspar-rich granitic and syenitic pegmatites all over the world. 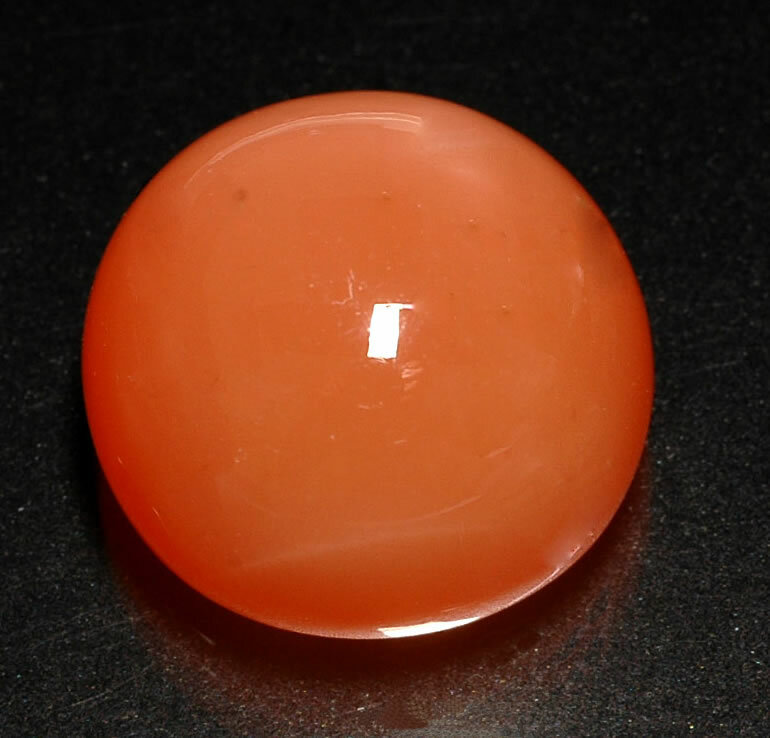 The most important moonstone deposits are from Sri Lanka and India. Other notable sources include Australia, Brazil, Germany, India, Myanmar (Burma), Madagascar, Mexico, Norway, Switzerland, Tanzania, and the United States. Sri Lankan moonstone is most famous for its attractive blue colored material, but blue moonstone is becoming increasingly rare. India is known for producing fine 'rainbow moonstone'. Switzerland's Adula Mountains possess the most historically interesting moonstone mines. Moonstone is typically colorless, but it can occur in a wide range of colors, including gray, mocha brown, yellow, orange, green, pink, blue and white. It most often exhibits a white to bluish-white sheen, but other sheens can occur such as silvery and blue-orange. Sri Lanka's moonstones with a pale blue sheen on a near-transparent body are considered most valuable. India's moonstones show cloudlike plays of light and color which are very valuable including beige brown, green, orange or simple brown. Rarer colors include blue, peach, smoke, champagne, black and red. Moonstone typically occurs with translucent clarity. Transparent specimens are uncommon, but not unheard of. Transparent moonstone is considered most valuable. Moonstone has an attractive vitreous to pearly luster when cut and polished. 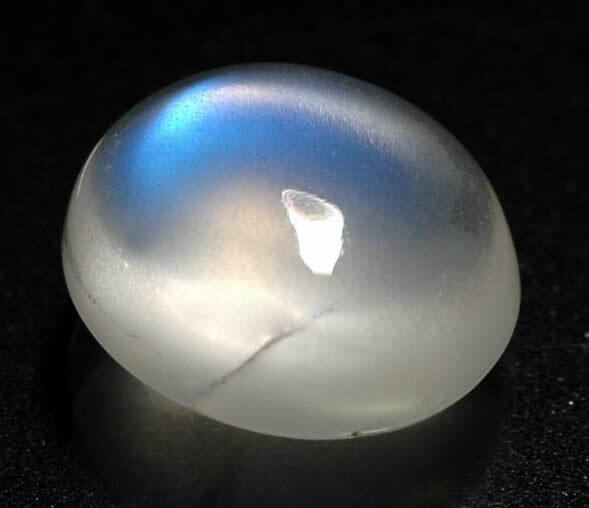 Some moonstones can exhibit chatoyancy. In the trade, these are known as 'cat's eye moonstone'. Other rare varieties of moonstone can occur with asterism effects. These are referred to as 'star moonstone'. Cat's eye and star moonstones are exceptionally rare and highly desirable. Moonstone is almost always cut en cabochon to maximize the desirable effects of adularescence. With moonstone, the orientation of the cut is very important. Appropriate height of the stone is essential to display the peaked light reflection, which is why most moonstone is cut with a high dome. Cutters must locate the crystal axis exactly in the zenith of the stone in order to achieve perfect orientation which results in maximized schiller effects. Moonstone is often cut in oval shapes since ovals tend to preserve the most carat weight. Some highly transparent stones may be faceted, but faceted moonstone is extremely rare. Moonstone is not known to be treated or enhanced in any way, but there have been reports of bright blue moonstones being 'coated' for color-enhancement. Few gemstones have accumulated as much lore and legend as that of moonstone. Moonstone has been revered for thousands of years by cultures from every part of the world. According to Hindu legend, moonstone was formed from moonbeams; at one time it was believed that if you held one in your mouth during a full moon, you could see your future. In India, moonstone is regarded as a sacred stone and it is widely believed to bring good fortune for those who wear it. In Arab countries, women were known to sew moonstone into their undergarments, because they were thought of as a symbol of fertility. In ancient Rome, moonstone was associated with the moon. It was speculated that the gem was formed from drops of moonlight. The gemstones were believed to possess the properties traditionally associated with the moon, including legends of romance, femininity, intuition, dreams, emotion and love. Moonstone is also highly prized among lovers, as it's thought to arouse tender thoughts and passion. Those who possess moonstone are thought to be able to foretell their future life together as a couple. Moonstone is the official birthstone for June and is associated with the zodiacal sign of Pisces. In Antiquity, as well as in the Middle Ages people believed that the cosmos is reflected in gemstones. The esoteric movement revived the ancient belief and the gem industry made it another marketing tool to promote certain gems. The healing powers of gems remains a controversial issue, but has been mentioned for centuries by healers, shamans and medicine men of many cultures and civilizations. Whether it's a fact or simply a placebo effect, it truly doesn't matter as long as it helps those who need it. The best practice for crystal and metaphysical use is to wear the gemstone in direct contact with the skin, especially close to the troubled part of the body. Physically, moonstone is thought to alleviate the symptoms and pain associated with headaches and common muscular backaches. Though moonstone is not as hard as most other types of jewelry gemstones, it remains one of the most popular gemstones for jewelry. In fact, moonstone jewelry has been worn for centuries, dating back to ancient Greek and Roman civilizations. Moonstone jewelry should be limited to protective-style jewelry applications, such as earrings, pendants, pins and brooches. Moonstone can also be worn as rings, but care should be taken to prevent scratches and blows. The wearing of moonstone rings should be limited only to occasional wear as moonstone gems are not durable enough to handle everyday wear and tear like quartz or other harder gems. Moonstone is most often cut as cabochon, but some transparent materials may be faceted and these faceted stones are excellent for open settings, such as prongs. When cut en cabochon, designs are limited to closed style settings which can accommodate flat backs. Moonstone is extremely sensitive to pressure, so extra care should be taken when setting and cleaning moonstone. Cat's eye moonstone and star moonstone gems are quite popular for men's jewelry designs, such as cuff links and tie-tacks. Moonstone is not very durable or hard compared to other types of jewelry gems, such as quartz, tourmaline or sapphire. Since ordinary dust often contains quartz, simply wiping dust off your moonstone can eventually result in surface scratches and reduced polished. Therefore, quite a bit of care should be taken to retain the beauty of your moonstone. Do not use any harsh chemicals or cleaners to clean your gems. Avoid using ultrasonic cleaners or steamers. Simply use a mild soap and a soft cloth to clean your gemstones. Rinse well under warm water your gemstone to remove any soapy residue. Moonstone is considered sensitive to pressure, so do not set your stones using tension-style mountings. Always remove moonstone jewelry before exercising, playing sports or performing household chores. When storing your moonstone, store them separately and away from other types of gems and jewelry, whether harder or softer. If possible, wrap your stones individually using a soft cloth, or you can place them inside a fabric-lined jewelry box for added protection.